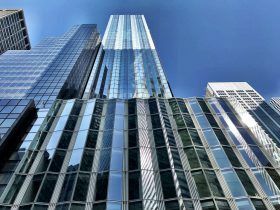 Construction of Norman Foster’s ritzy One Hundred East 53rd Street tower is complete! The Midtown East tower designed by Norman Foster’s Foster + Partners is finally finished. As CityRealty reported, the glassy design of One Hundred East 53rd Street takes into account the bronze hues of its historic neighbor, the Seagram Building, with a counter curtain wall. 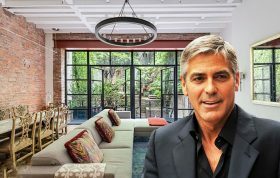 The luxurious residential building continues to be a magnet for celebrities, including couples like George and Amal Clooney and Cindy Crawford and Rande Gerber. The amenities are also of star quality: a wellness center, library lounge, swimming pool and a restaurant from the French chef Joël Robuchon who has earned 34 Michelin stars. 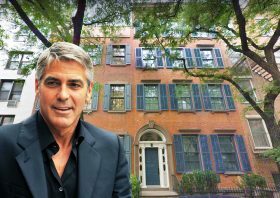 The Clooneys are moving to Midtown. Sources tell the Post that the power couple has just purchased an apartment at the glassy Norman Foster-designed One Hundred East Fifty Third Street. 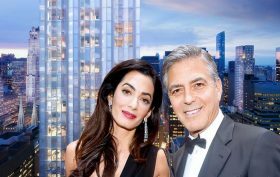 The pair had apparently toured the $65 million, two-floor penthouse but ultimately opted for something a bit more modest on a lower but still high floor.